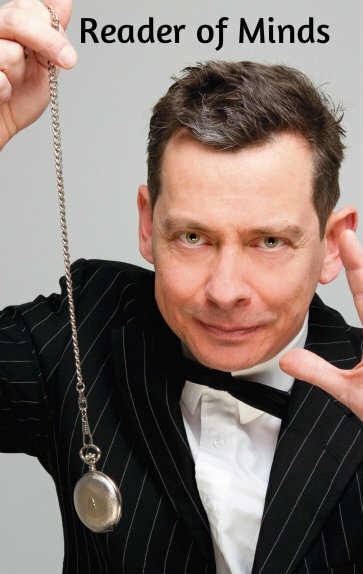 Paul Voodini works professionally as a mind-reader, psychic and mentalist. Having worked for many years alongside the UK’s most popular “shut eye” mediums and clairvoyants, he has studied their performance techniques and is now able to present to you the subtle art of ungimmicked mind-reading – as practiced by mediums, clairvoyants and psychics around the world. However there will be no talking with dead people! What Paul presents here is a totally new approach to mind-reading, free from billet switches, center tears, electronic gimmickry and stooges. This is “hands free” mind-reading, made possible by studying techniques employed in the shut eye world. These techniques have been honed and improved until Paul is now able to teach you how to present a mind-reading show that appears to be more genuine than the real thing! But wait. There’s more! Once you have learnt how to present a gimmick free mind-reading show, Paul will also delight in teaching you how to transfer these techniques to the private reading arena. Using the techniques described within this PDF ebook you will be able to provide breath-taking Tarot card and palm readings in an intimate one-to-one setting. And yes, there’s still more. To complete this astounding piece of work, Paul also presents to you “The Hand of Destiny” – a wonderful routine that combines a genuine palm reading with a simple piece of card magic to create an astounding experience for your spectator. This routine is ideal for the close-up environment and is sure to go straight into your repertoire. Indeed it would not be over-stating things to say that this routine by itself is worth the price of this ebook. “Reader of Minds combines a wealth of real working experience with a depth of knowledge about mentalism and readings to provide a great overview and entry into the world of propless psychic entertainment. Paul walks you through a series of easy to follow steps that take you to a new level of understanding. His experience shines through and his practical examples and avoidable pitfalls make this a valuable addition to the magical and mystery entertainment literature. A must read,” – Dr Todd Landman MMC – the Metaphysical Magician, Co-Founder of the British Society of Mystery Entertainers.